(Nanowerk News) Light can now be used to achieve ever better control of microparticles and nanoparticles. 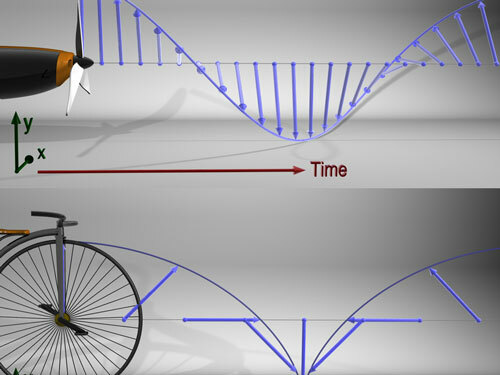 Researchers at the Max Planck Institute for the Science of Light in Erlangen are now able to use a laser to cause tiny particles to rotate around an axis perpendicular to the light beam – a particle thus rotates like the wheel of a bicycle in its direction of motion. The researchers achieved this by creating a photonic wheel: light with purely transverse angular momentum. This state of light was previously unknown. Physicists assumed that all light had propeller-shaped, longitudinal angular momentum. The new way of controlling light waves makes optical tweezers, which can be used to grip and manoeuvre cells and other micro-objects and nano-objects, more versatile ("The photonic wheel - demonstration of a state of light with purely transverse angular momentum"). 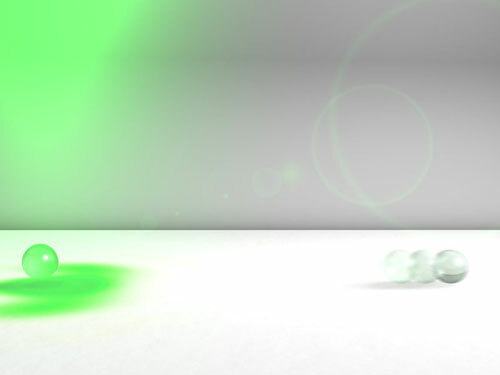 Nanoparticles with a spin: A photonic wheel (indicated by the green spot on the white background) causes a nanoparticle in an optical trap to rotate around itself in the direction in which the light is propagating. As soon as the optical trap is opened, the particle’s rotational motion causes it to hurtle away. Light can exert incredible forces. According to the rules of quantum mechanics, light is an electromagnetic wave, as well as a stream of photons. Since it has momentum, a transparent particle through which a light beam falls experiences a recoil when the photons leave it. Although the force which a photon exerts in this process is almost infinitesimal, the effect of innumerable light particles in intense and tightly focused laser beams adds up in such a way that objects up to a few micrometres can be held in an optical trap or moved in a specific way. Biologists, for example, use this effect in optical tweezers to fix cells and rotate them at the focus of a microscope. To this effect, scientists working with Gerd Leuchs, Director at the Max Planck Institute for the Science of Light, are now creating new possibilities for them. The team has created a photonic wheel, i.e. light with purely transverse angular momentum: the electric field of the electromagnetic wave rotates about an axis whose orientation is perpendicular to the direction of motion, just like the axis of a wheel. Until now, physicists have mainly been familiar with light with longitudinal angular momentum where the electric field rotates like a propeller around an axis aligned along the direction of motion. “The possibility that light can have purely transverse angular momentum when averaged over the complete cross-section of the beam had not been realised before,” says Peter Banzer, who made a significant contribution to the discovery. This is because, as the Erlangen-based physicists have now shown both theoretically and practically, it is indeed possible to generate light with purely transverse angular momentum - and what’s more it is surprisingly easy to do so. “Once it’s down on paper, it looks easy,” says Gerd Leuchs. But somebody has to come up with the idea in the first place. The researchers are now developing this idea using circularly polarised light. A wave of circularly polarised light turns like a screw around the direction of beam propagation and has propeller-like longitudinal angular momentum. Light with circular polarisation can be generated with the aid of a birefringent crystal, for example. Propeller or wheel: In circularly polarised light, the vector which represents the electric field of the light wave (blue arrows) rotates helically in the direction of propagation. Such an electromagnetic wave has longitudinal angular momentum. If two circularly polarised waves rotating in opposite directions meet at a focal point, light with purely transverse angular momentum is generated. Its electric field vector rotates about an axis perpendicular to the direction of propagation like a bicycle spoke. Whether the light wave turns clockwise or anticlockwise depends on the orientation of the crystal. The physicists in Erlangen combined two disks of this material such that one part of the laser beam rotates clockwise and the other part anticlockwise. They then used a lens to focus the two partial beams rotating in opposite directions onto a focal point of the size of the light’s wavelength. “Our theoretical considerations showed that we obtain light with purely transverse angular momentum in the focus - the photonic wheel,” says Peter Banzer. This special property is also evident in the experiment. They have already used a gold nanoparticle to measure the characteristic shape of the focal spot, which is closely related to the purely transverse angular momentum of the focused beam. As yet, there is still only indirect proof that the light field rotates about a transverse axis. However, the Erlangen-based physicists want to soon use the rotating light field to cause a nanoparticle to rotate about itself.